Funded By Anonymous Donors, Nonprofit Organizations Played A Large Role In Campaigns for The Michigan Senate This Year, Sponsoring Everything From TV Ads To Canvassing. LANSING (NOV. 16, 2018) — Powered by anonymous donors, nonprofit organizations spent at least $3.1 million this year — and likely much more — trying to shape the makeup of Michigan’s 38-member state Senate. While some of the nonprofits appeared to be focused on electing candidates who agreed with them on specific issues like energy and auto insurance, the majority of the spending came from just four organizations that had a more partisan focus. Those four shelled out an estimated $1.8 million in the weeks before the November election for negative TV ads criticizing Democratic candidates, according to public disclosures and an analysis of TV ad-tracking data from Kantar Media/CMAG. The four groups combined to spend money in nine of the most competitive Michigan Senate races. The Republican candidates ended up winning in five of the nine races, helping the GOP take a 22-seat majority. Democrats will control 16 seats. In Michigan, state Senate terms are four years. According to public filings, the four groups spent most heavily against Democrat Dayna Polehanki, who was running in the Livonia-area 7th District and Rep. Henry Yanez, who was running in the Macomb County-based 10th District. Polehanki defeated Republican Rep. Laura Cox while Yanez lost to Republican Michael MacDonald. Yanez said the advertisements were “relentless” in the weeks before the election. MCFN tracked an estimated $337,000 in TV ad spending by two of the groups, Michigan Citizens for Fiscal Responsibility and A Public Voice, in the 10th District. The spending by Michigan Citizens for Fiscal Responsibility and A Public Voice amounts to about 17 percent of the overall money MCFN has tracked in the 10th District race. 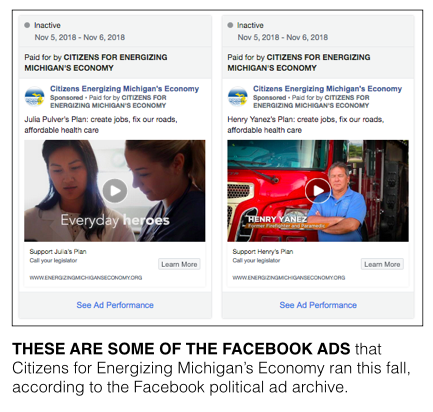 Another nonprofit group called Michigan Citizens for Energizing Michigan’s Economy ran an estimated $250,000 in positive ads about Yanez, according to one estimate provided to MCFN. With that group’s spending factored in, nonprofits that don’t have to disclose their donors were responsible for nearly 30 percent of the $2.0 million that MCFN has tracked in the 10th District race so far. The groups’ spending is an example of what’s known as “issue advocacy.” Because the ads don’t explicitly tell viewers how to vote, they don’t fall under Michigan’s campaign finance disclosure requirements. So there’s no way for the public to track where the money is coming from. This make it impossible to tell whether unidentified funders are rewarded with public policies that serve their interests after the election. There are also few ways to track how much is being spent. MCFN follows the money through TV ad-tracking data from Kantar Media/CMAG and by analyzing hundreds of disclosures filed with the w88 dashboardFederal Communications Commission. The disclosures cover ad time sold by TV stations to political groups. However, when it comes to other forms of advertisement, like mailers, billboards and paid canvassers — all of which nonprofit groups funded in state Senate races in 2018 — it can be impossible to track nonprofit spending. Who’s Behind The Dark Money? None of the four groups that spent money in the weeks before the election criticizing Democratic Senate candidates through TV ads responded to requests for comment this week. The biggest spender appeared to be Michigan Citizens for Fiscal Responsibility, which spent an estimated $1.1 million on TV ads, according to MCFN’s tracking. The group is a 501(c)(4) social welfare organization that shares a downtown Lansing address with the Sterling Corporation, according to past tax filings. The Sterling Corporation does consulting work for the Senate Republican Campaign Committee and Moving Michigan Forward II, a PAC connected to Senate Majority Leader Arlan Meekhof. Moving Michigan Forward II ran its own Facebook ads criticizing Democratic Senate candidates. The other nonprofit groups’ interests in Michigan are less clear. Citizens for a Working America spent an estimated $86,000 on ads criticizing former Democratic Rep. Sean McCann in his race against Republican Sen. Margaret O’Brien in the Kalamazoo-area 20th District. McCann won. The other two groups both listed Ohio addresses. A Public Voice used a Thornville, Ohio, address on its 2016 tax filing, and Jobs and Progress Fund used a West Chester, Ohio, address. The groups were jointly listed on some ad purchase disclosures in Michigan this fall, but most of the ads included only A Public Voice in their disclaimers. The groups combined to spend $573,000 on ads in Michigan Senate races. The ads tended to air in the final two weeks before election after Michigan Citizens for Fiscal Responsibility had stopped airing its ads. As an example, A Public Voice aired an estimated $109,000 in ads against Democrat Poppy Sias-Hernandez in the 34th Senate District. A Public Voice’s ad was very similar to the ads Michigan Citizens for Fiscal for Responsibility previously aired against Sias-Hernandez. Michigan Citizens for Fiscal Responsibility aired an estimated $48,000 in ads against her. That spending amounts to about 9 percent of the $1.8 million MCFN has tracked in the 34th District race so far. 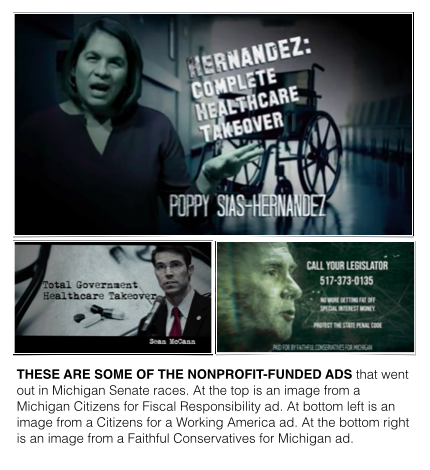 The ad from Michigan Citizens for Fiscal Responsibility criticized Sias-Hernandez for supporting a “complete government takeover” of health care. Sias-Hernandez said she tried not to expend much energy on the attacks against her. But she said the ads did seem to gain some traction in the West Michigan district. Sias-Hernandez ended up getting 46 percent of the vote in her race against Republican Jon Bumstead. Bumstead won with 50 percent. MCFN tracked nonprofit spending in at least 16 of the 38 state Senate districts this year. Citizens for Energizing Michigan’s Economy, a nonprofit that’s previously received funding from Consumers Energy. was involved in a number of races for both the Senate and the House. Many lawmakers believe the group targeted candidates who didn't agree with the state's major electric utilities on key issues. When it comes to Senate races, the organization aired an estimated $81,000 in ads promoting Rep. Aric Nesbitt before the Republican primary in the 26th District and $75,000 in ads promoting Rep. Mike Callton before the Republican primary in the 19th District. Nesbitt won the 26th District seat while Callton lost in the primary. The group also aired at least $58,000 in radio ads promoting Rep. Brett Roberts in his GOP primary race against Rep. Tom Barrett in the 24th District. Barrett went on to win the primary. In the general election, Citizens for Energizing Michigan’s Economy aired TV ads and digital ads promoting Yanez in the 10th District and Democrat Julia Pulver in the 15th District. The group spent an estimated $253,000 in the 10th District and $35,000 in the 15th, according to one tally provided to MCFN. Similarly, another nonprofit, Faithful Conservatives for Michigan, spent at least $264,000 — and likely more — on TV ads either criticizing Republican Rep. Gary Glenn or promoting his opponent former Rep. Kevin Daley in the GOP primary in the 26th District. Glenn, the chair of the House Energy Committee, has accused the state’s major utilities of funding Faithful Conservatives. Another nonprofit, Detroiters for Change, was focused on auto insurance policy. That group got involved in a number of Detroit-area races for the Legislature, promoting candidates supported by Detroit Mayor Mike Duggan, who’s pushed to lift the requirement that auto insurance policies feature unlimited medical coverage for catastrophic injuries. The group sent out mailers, funded Facebook ads and sponsored billboards. In the Senate races, it spent thousands of dollars on Facebook ads before the primary promoting Democrats Adam Hollier in the 2nd District and Marshall Bullock in the 4th District. Both Hollier and Bullock won. The group spent a smaller amount promoting Democrat Rep. Sylvia Santana, who won in the 3rd Senate District. Santana also won. Yet another nonprofit, a group called Bipartisan Solutions, spent an estimated $150,000 on TV ads promoting Democrat Kelly Rossman-McKinney, who ran against Barrett in the 24th District. 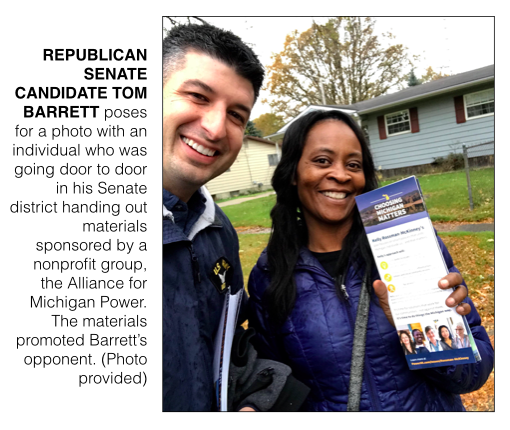 She also received aid from a nonprofit called the Alliance for Michigan Power, which according to Barrett, sent people door to door in the district, handing out materials promoting Rossman-McKinney. Barrett posed for a photograph with one of the canvassers who apparently didn't recognize he was Rossman-McKinney's opponent. The 24th district also saw Michigan Citizens for Fiscal Responsibility and A Public Voice spend an estimated $121,000 on ads criticizing Rossman-McKinney. On top of all of those dollars, the Michigan Chamber of Commerce’s super PAC was also heavily involved in the 24th District. The super PAC reported spending $168,777 in support of Barrett this fall. The super PAC received the wide majority of its funding from two nonprofit trade associations: the Michigan Chamber of Commerce, and the Michigan Insurance Coalition. The super PAC spent $294,350 in other state Senate races this fall. Sen. Mike Shirkey, a Republican who will be Senate majority leader next term, introduced a bill on Nov. 8 that aims to ensure nonprofit donors remain secret. The bill, Senate Bill 1176, would ban any state or local public agency from requesting information about supporters of nonprofit organizations, including nonprofit groups that spend money to influence voters in the weeks before an election. It could prevent future efforts to bring light to the dark money in Michigan politics. Senate leadership referred Shirkey’s bill to the committee he chairs, the Michigan Competitiveness Committee.